Doha, Qatar: Northwestern University in Qatar (NU-Q) hosted a book reception to recognize the recent publication of four books, authored or edited by faculty and staff. 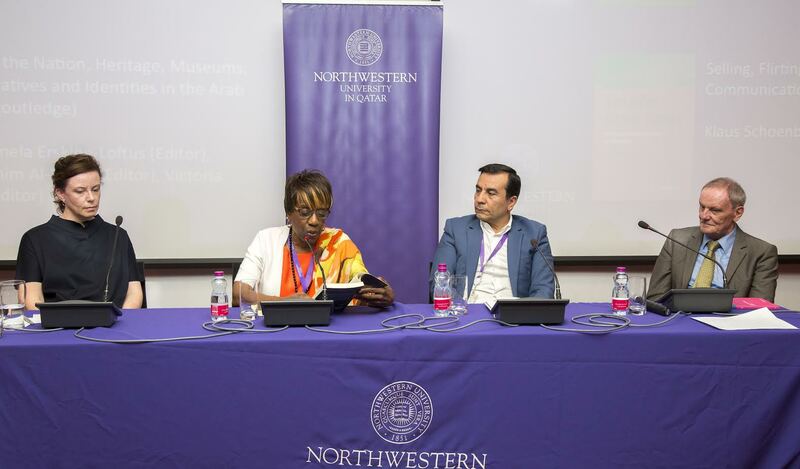 The four are Professors Khaled AL Hroub and Sandra Richards; Associate Dean Klaus Schoenbach and Pamela Erskine-Loftus , director of the forthcoming Media Majlis at Northwestern University in Qatar. AL Hroub and Richards are, respectively, Middle East and African American studies scholars, while Schoenbach is a communication researcher and Erskine-Loftus an authority on museums. AL-Hroub, a renowned scholar and writer in the Arab World, joined NU-Q from the University of Cambridge where he remains a senior research fellow in the Centre of Islamic Studies of the Faculty of Asian and Middle Eastern Studies. He is the author of several books, including: Hamas: A Beginners Guide, Hamas: Political Thought and Practice, and in Arabic: Fragility of Ideology and Might of Politics, In Praise of Revolution, and Enchantress of Poetry, among others. Richards has co-edited Approaches to Teaching the Plays of August Wilson, which compiles a series of essays that help readers make sense of Wilson’s work in relation to movements and cultural trends that were widespread at the time. “The range of essays in this book provides readers with a comprehensive array of perspectives and insights on some of Wilson’s plays, that will help students and teachers gain a deeper understanding of his work,” said Richards. “Wilson’s work revolves around black Americans living through migration, industrialization, and war, as well as the ways black communities identify with America’s collective identity, and these are issues that still resonate with many people today,” said Richards. Richards is a distinguished expert in American, African American, African, and African diaspora theatre and drama, having authored Ancient Songs Set Ablaze: The Theatre of Femi Osofisan and numerous articles on a range of black dramatists. Among her honors, are a Performance and the Public Sphere: A Festschrift in Honor or Professor Sandra L. Richards, at the University of California, Berkeley; and Outstanding Teacher of Theatre in Higher Education, from the Association for Theatre in Higher Education. In addition to her work at NU-Q, Richards is professor of African American studies, theatre, and performance studies at the Northwestern University campus in Evanston, IL, USA. Combining her expertise in museum studies with her experience working in the Middle East, Erskine-Loftus co-edited a book that compiles a series of scholarly research papers on the cultural scene in the Gulf Region. Representing the Nation, Heritage, Museums, National Narratives and Identities in the Arab Gulf States sheds light on new areas of discovery around the Gulf’s national identity and museum development. “There are so few books that have anything to do with media heritage and museums in the Gulf. It’s a new and majorly underexplored area for research. This book compiles 16 papers that investigate different areas around the topic of national identity and heritage, and the ways by which such narratives are conveyed in museums around the region,” said Erskine-Loftus. She is the editor of and contributor to two previous books, Reimagining Museums: Practice in the Arabian Peninsula, and Museums and the Material World: Collecting the Arabian Peninsula. Her recent publications include editing the inaugural edition of Multaqa: A Forum for Gulf Museum Educators, a professional journal on museum practices in the region, and authoring an essay on Peninsula museums as creators of visual identities in Visual Culture(s) in the Gulf: An Anthology. Erskine-Loftus received her PhD in Arabian Peninsula museology from Newcastle University, UK. Previously she held positions at the Museum of Contemporary Art San Diego, The Museum of Modern Art in New York, Sharjah Museums Department, UAE, and Qatar Museums. Schoenbach has recently had published an updated version of his German book, Verkaufen, Flirten, Fuehren: Persuasive Kommunikation (Selling, Flirting, Leading: Persuasive Communication). “Most people think that being a skilled persuasive communicator is an art that only some are gifted with; however, I believe that there are specific tactics and strategies that can be learned and implemented to create a persuasive argument. In my book I present and explain 23 different strategies to do so,” Schoenbach said. Schoenbach is internationally known for having led communication programs in Germany, Austria and the Netherlands. In addition to his position at NU-Q, he is also an honorary professor at Zeppelin University, Friedrichshafen, Germany, and an honorary fellow of the Amsterdam School of Communication Research, University of Amsterdam, Netherlands. He has held the endowed BBDO Chair of Media Studies at Zeppelin University, and served as its dean of the faculty for Communication and Cultural Management. He also served as its vice president, responsible for the research school and for international relations.